Happy Spring Break, St. Patrick’s Day, and Anniversary! What? Oh, wait. I’ll come back to that last one. The middle of march has a lot of significance for me as an adult, but I have to admit it meant nothing to me growing up. Which is funny since there is a fun holiday, plus March is a big month for spring breaks. Unfortunately, I went to school back when Spring or Winter Break for K-12 was unheard of. When you’re 10, this is heaven! At least no one in Harrison County had ever heard tell of such a thing. But back then (the late 70s) in Ohio, we had the next best thing: SNOW DAYS! The late 70s were some of the worst winters on record in our rural county, so we had a LOT of snow days. In fact, one winter we were out of school for three whole weeks! I may be mis-remembering this, but it was a LOT anyway. Ask my Mom, she’ll tell you how long it seemed. 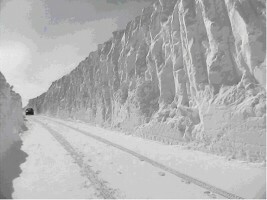 Really, the road in front of our house was covered with a full five feet of snow. So to actually schedule a “spring break” or “winter break” in March would have been silly, since the district would have had to cancel it anyway to make up for all the missed days in January and February. 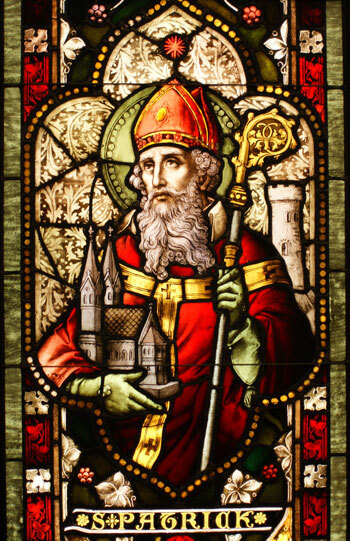 And although my family’s Irish roots run deep (I think I’ve already mentioned that my great-great-great-great grandfather came over to Maryland in 1812 and settled in what was yet to become Ohio in 1816), we never celebrated St. Patrick’s Day beyond wearing green to school (and cruelly pinching those poor saps who forgot!). Which is odd, because SO many of the settlers in that area of Ohio back then were Irish. But no, I guess too many generations had passed for any Irish pride or tradition to have survived from the Henderson side of my family. Pity. Then twenty years ago, St. Paddy’s Day marked a lovely little milestone for me as an incredible surgeon at NYU gave me a whole new smile, face and outlook on life. My jaw surgery was pretty monumental for me, and for twenty years now I mark the day with silent gratitude. But still nothing Irish. Finally, a few years ago on St. Paddy’s Day, my Filipino husband surprised me with a slow cooker full of corned beef and cabbage and potatoes and carrots. It was delicious, and it just felt right. Since then, we mark the occasion with this hearty meal. And maybe a Guinness or two (but no green beer, thanks very much). I think connecting with the food of my peeps has even given me a bit of an Irish swagger come the 17th. 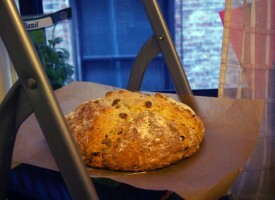 Which brings me finally to this week’s recipe, an old fashioned Irish soda bread amped up with a modern twist. Since my people came to America before baking soda made its way to the Emerald Isle, (and because my family had long since assimilated any ethnic pride right on out of their blood), I never had soda bread until I came to NY. My first taste came from a lovely Irish lesbian who was showing me the room she had for rent in her apartment in Astoria Queens. It was painted black by her former roommate, windows and all, so frankly, it was a bit of a hard sell. Actually, there were two of us there looking at the room, me and another young man. Sensing neither of us was very interested in the room, she set about trying to make a match between the two of us. She’d just baked some soda bread and offered us some of the still-warm loaf as she peppered us with personal questions trying to break the ice. I remember thinking he was cute, but not my type (whatever that meant) and the bread was a little bland and dry. I realize now it was just not very good soda bread, bless her little Irish heart. It was some time before I ventured to sample another Irish soda bread, and when I did it was from Amy’s Bakery in Hell’s Kitchen here in NYC. Whoa – nooo resemblance between the Irish-lesbian-matchmaker’s soda bread misadventure and the light and flavorful loaf that Amy’s is famous for. I fell in love with this simple treat, so of course I had to make it my own. 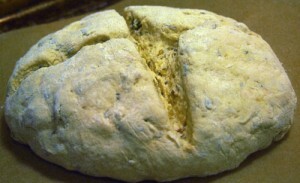 Come to find out, soda bread comes in any number of variations. The basic, classic Irish white soda bread is what you’ll find at mealtime all over the Emerald Isle-no raisins, no caraway seeds, just good honest bread tinged with the slight ammonia scent from the baking soda (something I don’t love, and so I ‘fix’ that in my version). The raisin studded version that is so ubiquitous here in America is actually more likely to come out with the tea trolley in Ireland, or maybe toasted for breakfast. Fine by me: I’m a big fan of tea time! So I set about to make a loaf that’ll fit right in come 4pm: a moist, light texture, a great crust, raisins and caraway seeds in moderation, the tang of buttermilk, and a little brightness to bring balance to my loaf. A basic soda bread is not really a sweet item, but I found loads of recipes with a quarter cup or more (one even had a half cup!) of sugar. I knew didn’t want to go down that route. After all, this isn’t a giant muffin. I looked for ways to bring flavor without the sugar. Caraway seeds in moderation (I use half what many recipes call for) and a little Barefoot Contessa inspiration of adding orange zest give my loaf a light sweetness with only one tablespoon of sugar. And you can easily omit the sugar entirely and still have a wonderfully tasty loaf. This recipe is light and full of flavor, and since it’s light on the sweet, it’s just as good paired with a corned beef dinner as it is toasted the next morning with your morning tea! In a measuring cup, measure the buttermilk then add the egg and orange zest and lightly beat with a fork. With the mixer on low, slowly add the wet ingredients and mix just until a wet dough forms. Let the faeries out or they’ll bake right in like the baby in a King Cake. Ewww. Turn the dough out onto a floured work surface and knead briefly (15 seconds or no more than 5 folds and turns of the dough; ) and form a round about 7 inches across. The MTK cooling rack – a step stool by the window! Bake at 400º F for 35-45 minutes (40 minutes usually does it for my loaves). The bread is done when the loaf is deeply golden and crusty on the outside and produces a hollow sound when you tap on the bottom, or when the internal temperature on an instant-read probe thermometer reads 195º-205º. Cool on a wire rack. Serve warm with plenty of sweet butter. 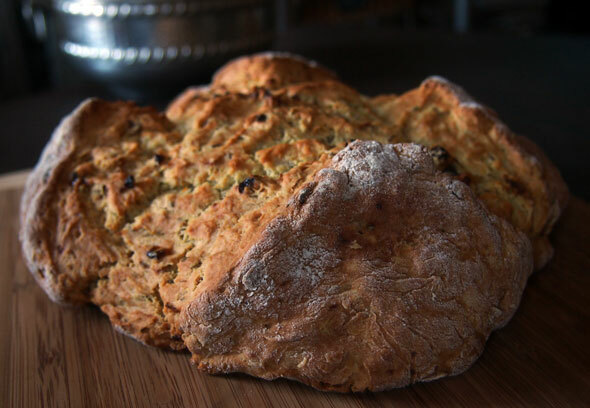 first it's the cauliflower crack… now the soda bread… you are making me a BMC addict! !